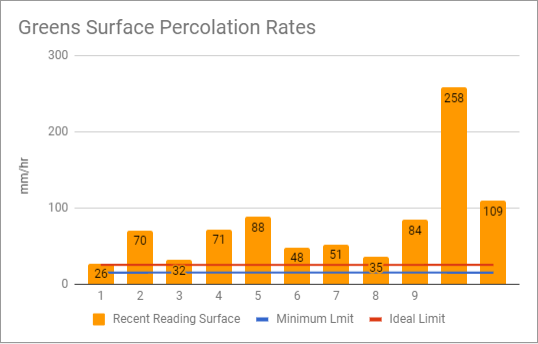 In my last post I discussed how too much aerification might be a bad thing and wondered if more is better or if there is an ideal amount of compaction that we can maintain to maximize soil health and help us reduce the inputs that we currently require to maintain our putting greens. Inputs like sand, fertilizer, tines, fungicide and water. I then shared how my greens have never performed better based on some anecdotal observations. 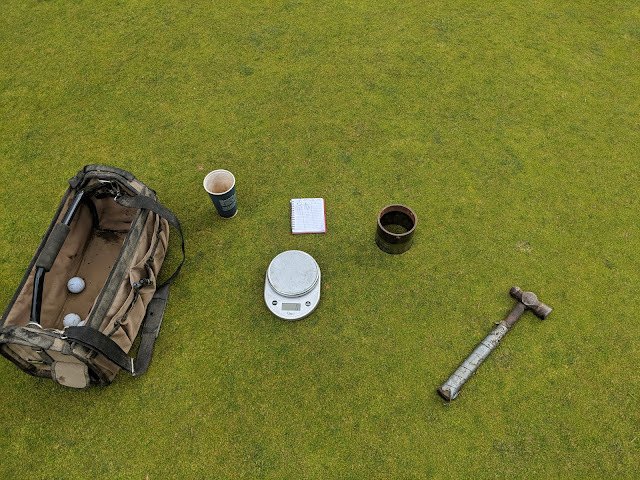 Yesterday I decided that if I was going to try and aerifiy less or not at all that I would need to measure the things that aerification is supposed to manage so that I can track their change over time. Simply not doing something without knowing that it's working is simply a dumb thing to do. As usual, there were a ton of products that I needed to buy to figure out this kind of hokus pokus but then I remembered that I'm not doing super precise science here. I want to get a general idea of how my greens perform and relate that to my observations on how they actually perform and meet my expectations for my course's specific needs. I have always measured organic matter when I soil test so I don't have to do anything different here. To measure the percolation rate you can buy all kinds of fancy tools to measure how fast water moves through the soil but I decided to do it on the cheap. I used an old cup cutter blade and marked a line 6cm up from the bottom. This is how far I drive it into the green. I then fill it with water up to the bottom of the top ring and start a timer. I come back, record the time and how far the water has dropped. This gives me the infiltration rate in mm/hr. 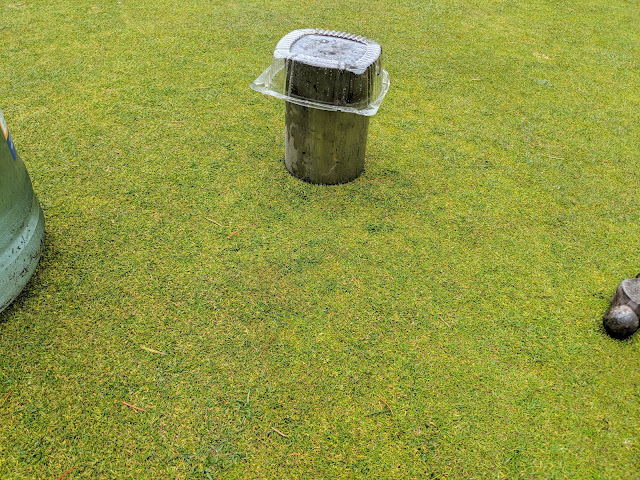 It was raining so hard I needed to cover the top of the old cup cutter blade to prevent it from filling back up! Is this method perfect? Not even close. Typically you would want a double ring tester where the larger outer ring is also filled with water but not measured. This reduces lateral water flow below the cup cutter blade. For my testing my soils were at or above field capacity (36%VMC) so I wasn't too worried about it. You could always hammer the cup in deeper to a point below the majority of the roots (for me this is 6cm) and forget about the infiltration rate below that point. You should also use a constant time to measure the infiltration rate because the rate can vary from the first few minutes as the soil saturates. Again, I'm not too worried about being super precise here. I just want to know if my greens drain good. I have only found drain pipe in one of our greens. Guess which one? Regardless, they all drain better than is needed. So how fast should the greens drain? According to this blog post by the STRI we should aim for drainage at least 15-25mm/hr. If you find a green with issues, ask yourself if the grass is bad because of it, then do further testing to see if it's an isolated issue or widespread. You can test various depths to see if it's a surface issue or an issue that needs to be addressed with drainage or deep tine aerification. 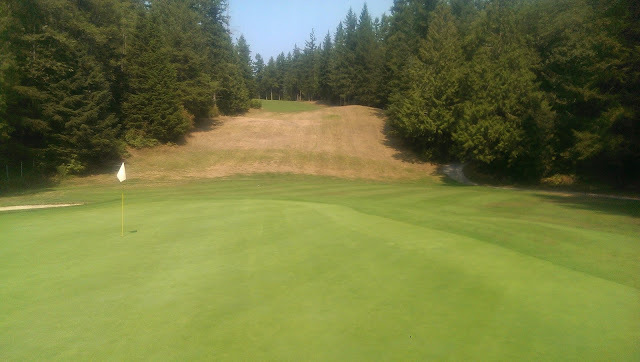 I think you will find quite a bit of variation from one green to another and even across a single greens as the topography and distance from drain line changes. All we are trying to do here is look for issues and negative changes over time. If we find issues we can them make informed decisions about them and if there are no issues we can do nothing! As you can see in the above chart, All my greens drain more than adequately despite hardly aerifiying them in the past years. I really wish I had data from years ago to compare because I have a hunch that they drain better today then any time in the past. I also wonder if they will improve with less aerification or get worse. The only way to know is to wait and see! It will be interesting to see how these numbers change over time especially following a wetting agent application coming next week. I have 4 old cup cutter blades so I can do the testing on a rotation. To do 12 greens it only took me 1 hour to test this so I will be testing this much more often in the coming months and years. It's a super easy test to do and if it can reduce the amount of aerification required, then it will more than pay for the effort required to do the testing. I also started measuring soil bulk density. We want to ensure that the soil isn't too compact that we limit root growth. Maybe we can use wetting agents in the winter to move water through a compacted soil, but roots still need physical space to grow. To measure bulk density I also used an old cup cutter blade. I measured the cross section, calculated the area of the opening and then determined the depth I would have to drive the cutter blade to measure both 500cm^3 and 1000cm^3. I measured my cup cutter blade to have a diameter of 105mm. As we all know the area of a circle is Area = π r^2. Our radius is 52.5mm so the cross sectional area of our cup cutter is 8654mm^2 or about 86cm^2. To get the depth for a 500cm^3 cylinder we divide the volume by the circle cross section to get 5.8cm. Simple double that to get 1000cm^3 depth. So we want to find out the density of the soil in grams/cm^3. This is our bulk density. To do this first weigh your cup cutter blade. Then hammer it into the soil to the 500cm^3 depth and measure the combined mass of the cup cutter blade and the wet soil withing the blade. Make sure the bottom of the cup cutter is full of soil and it isn't sticking out at all. Subtract the cup cutter mass from the total mass to get the mass of just the wet soil. Ok great, but there's a problem. The soil moisture content will vary and soil moisture has mass. To figure out what the soil moisture weights take a paper cut. Weigh it, then add a sample of soil to the cup and weight it again. Now we can figure out the mass of a small sample of wet soil. Microwave the wet sample until it is completely dry. I like to stirr the sample to let the moisture leave it quicker. We now can compare the mass of the wet sample to the dry sample. This will give us a percentage. Typically this is about 80% for my soils. Every sample will be slightly different. Multiply this percentage by the mass of the total 500cm^3 sample to get the dried mass then divide this by 500 to get the bulk density. Depending on where you read, upper limits will fall anywhere from 1.6-1.8g/cm^3 with ideal limits around 1.25-1.35. I'm not too concerned with having minimum bulk density and more concerned with ensuring that it's not too high. Again, this isn't super precise, but it's good enough for our purposes. If you want more precision you can pay some companies a lot of money to do it for you. As can be seen, my greens are all within tolerable limits. I'm not as concerned about the absolute values I measured, but more so in the change over time. As is, the greens perform better than expected so who is anyone to say that the numbers I got are bad? The reason I am measuring this is to confirm that I don't need to aerify for drainage purposes. Most of the research about rolling and disease has found that infiltration rates weren't negatively impacted by double rolling daily so that I good to know for disease management. So if we can keep good drainage and optimize the pore spaces in the top few cm with rolling then maybe we can have the best of both worlds. If we measure the infiltration rates we can eliminate the guesswork and be confident that not aerifiying won't end in disaster. It can also confirm that aerification is warranted and make it much easier to justify this disruptive practice to golfers and management. If you don't measure this stuff you are simply guessing.